Will be interesting if both Oklahoma and OSU win out, whether OSU jumps them. Having Notre Dame behind Clemson & LSU at this point is a bit puzzling. I guess I can see behind Clemson, even though I disagree, but certainly not after LSU. Neither Miami or Auburn are ranked anymore. Notre Dame struggled with Pitt and Vanderbilt! As dumb as it is, style points do matter in the committee era! By their own rankings, the Michigan win is better than any win on Clemson or LSU's resume. My thoughts exactly. Sure it was a win at home, but it's the best win on the board thus far. These rankings basically tell ND - if you lose, you're out. Stanford falling off really hurt the Irish, Virginia Tech is another who's borderline top 25 I'm sure. -ACC has a few also - Syracuse beats NC State so they're ranked, NC State beats BC so they're ranked, BC has beaten who? Obviously a lot can change but past WVU at #13 no one else should sniff a chance at the playoff, regardless of what happens in the final month. From #14 on down there's a lot of mediocre football teams who have 2/3 losses with many wins coming against lower tier Group of 5 or FCS foes. Last edited by adselder09; 10-30-18 at 10:03 PM..
ND: is again getting by on name and economic power. Squeak by an also ran MAC team, they're best win is against a V-Tech that lost to Old Dominion. They're TBD at best, a schedule that seems to have caught several good teams in an off year. Are you sure their best win is against VT and not Michigan? They have one top 25 win - WVU. They've lost to Iowa and Oklahoma - Oklahoma St was ranked in either the coaches or AP poll but is not ranked in the CFP rankings. Notre Dame has the best win of anyone in the CFP Rankings in Michigan. They've also beaten Stanford at home and VA Tech on the road. A lot of chatter about how this could be setting up to have 2 SEC teams again. If 'Bama loses a close game to LSU or in the SEC title game they will be in over any 1 loss conference champ. Also don't be surprised if Oklahoma runs the table they get a slot. The B1G is Michigan or bust, no way do they put in tOSU with yet another blow out loss over a 1 loss team from any of the conference champs or ND. Very high probability it could be the same 4 as last year. I think OSU still has an outside shot. As long as Bama wins out, and Oklahoma and Washington State lose just one more game each. All very possible. Kentucky isn't winning out so they're gone. I think OSU jumps WSU if both win out. Agreed. They could get in if Michigan enters the game with one loss. At this point, I'd say Alabama, Clemson and Notre Dame will be in the playoff. I don't see any of these teams losing the rest of the way. I think the Buckeyes will win out, I just think there are too many teams for them to climb. The Big ten could be left out, believe it or not. OSU's best win is over TCU, and they have 5 losses now. Penn State has shown they are simply not that good. And it both of those games, the Buckeyes were in trouble. So yes, style point do count. The Buckeye loss at Purdue will remain one of the biggest upsets in recent history. On paper, that should had been a 30 point game - the other way. I do like this because it takes into account who you play. Now I don't like it because it doesn't include style points. I really think teams with big point spreads who struggle to win should have some kind of negative factor. Penn State beating App State at home in overtime should not could as one win, like a 40 point win over Illinois. I also like some kind of evaluation of the schedule not based on the polls. Wisconsin was in the top 5 in many polls to start the season, I don't think they are in the top 25 anymore. Teams beating Auburn, TCU is the same way. TCU was what #12 or #14 when the Buckeyes played them. They have 5 losses now. Not a good win anymore. I have considered including point margins and +/-, 14Red! Great teams have let down games all the time, is it right to punish them for it? I'm skeptical. Was wrong about Wazzu - thought they had 2 losses already. Their non-conference schedule is still awful, so if they run the table that likely keeps them out over 1-loss ND, 1-loss OSU/Michigan or 1-loss OU. Why is Miss St ranked so high with 3 losses? Are you sure their best win is against VT (ND) and not Michigan? My thinking is, Michigan has grown more than most teams this season. Perhaps the new QB. Perhaps getting the play calling wrapped around the new QB. Your rankings are absolute garbage. LSU moves up after losing? LSU is above Alabama? Clemson falls 5 spots after demolishing Louisville? Duke is #8 with three losses to average teams? WVU moves from unranked to #14 because they beat an average Texas team? Pitt ranked behind Duke, despite beating Duke? Georgia stays at 5 despite easily beating a ranked Kentucky team? OSU behind Penn State despite beating them? The whole thing is trash. I cannot stand mathematical formula's to figure out rankings. Some guy named Maher (sp?) does it for soccer, and while I can appreciate the hard work that goes into it there are too many issues with a formula. Pitt went from Not Raked to #12 with a 5-4 record, did they beat Clemson, WTF? 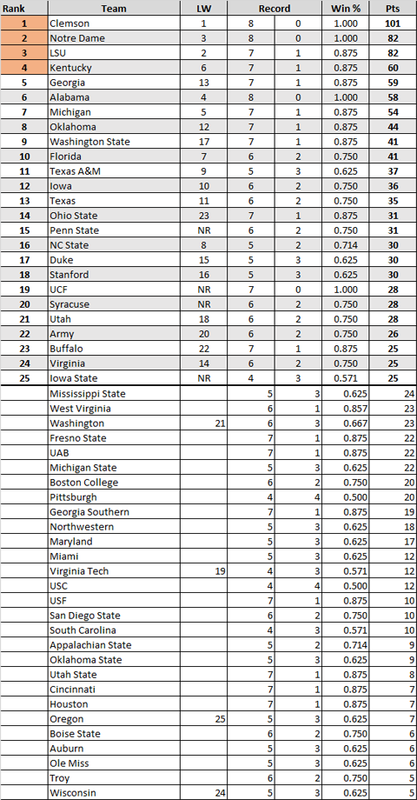 Duke, Pitt, Buffalo, and Army are all in the top 15. Might want to look at tweaking it in the off season. Does LSU still get top 10 points for beating a now unranked Miami? What about them getting top 10 points for beating Auburn? It appears they do. 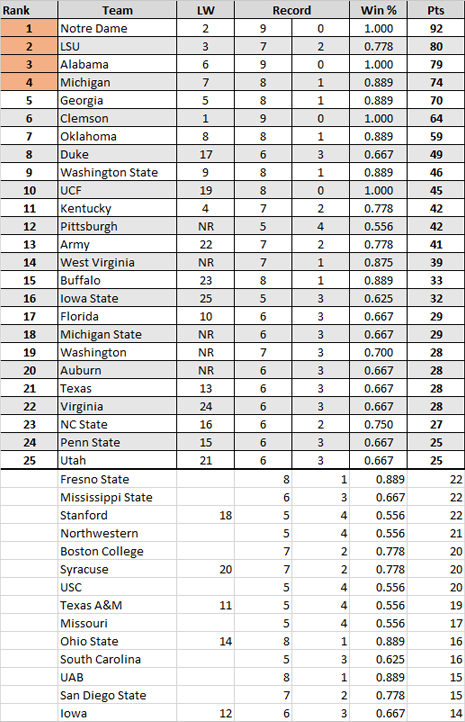 You weight your wins/losses based on opponents rankings and where they are ranked. Do you use your rankings to determine the weight or do you use AP/Coaches/CFP Committee rankings? For example would you get a top 15 weight for beating Buffalo bc they are ranked in your formula but not the AP? If you use your rankings how do you start the year with determining weights for top 25 wins? Do you use the AP at first and then switch to yours later at a different week? If that is the case the lack of consistency creates a problem throughout the season. I would look into trying to reevaluate wins and losses each week, so the point total is a dynamic number where it can change week to week based on improvements from your prior opponents and vice versa. For LSU to still get top 10 points for beating Auburn and Miami is one design flaw. Same thing goes for if a team lost/beat a team like UK who wasnt ranked until like week 4. Does Florida get hit the same with losing to an unranked team at the time they played, when UK is now top 15? Not criticizing but trying to offer suggestions bc I like your idea of the tiered relegation system, weighted wins/losses etc. Last edited by Arrogate; 11-08-18 at 12:23 PM.. I also see you get points for a win over an unranked p5 team with a record better than .500. Do you go back to check if those teams end up with a +.500 record and do you adjust the points? And vice versa for those that maybe had a +.500 record at the time but end the season with a losing record. There are other "improvements"/things to look at if you have an open mind to it. If not I will quit rambling. Again this shouldnt be read as demeaning or condescending towards you, just suggestions/questions to help improve your system. Doing a system like this would take up a lot of time and I assume this is a hobby and you have time constraints. Going back to check and readjust point totals would involve a lot more work. Taking into account the time constraints, this being a hobby, and trying to find a quick and easy formula, you did OK IMO.